One rather hidden feature is that you can view, edit and compare Project Items that you've copied in the Real Studio IDE by simply bringing the Drop Pad window to front, then pasting the clipboard (Edit -> Paste). Drop two (and one after the other) project files onto the Drop Pad's Project Comparison field. Open two Projects, e.g. 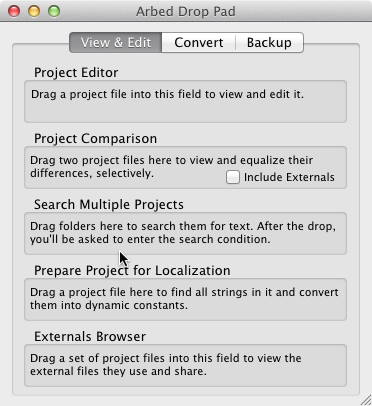 by dropping them into the Project Editor or by pasting copied items from the IDE, then choose from the menu: Project -> Compare Two Front Projects. You can find a string in all projects on your disk (or inside a folder) by choosing from the menu: File -> Find On Disk..., or by dropping the folder to search onto the Search Multiple Projects in the Drop Pad window. You will then be asked to enter the search terms. Any matching files will be listed in a new window. To view the searched text, simply double click the file in the window. To view the file in the Finder (or Explorer on Windows) instead, hold down the Option (Alt) key while double clicking the list item. You can also right-click on the found items to choose how to view them. Creates a text window listing all public methods with their parameters, plus any comments that are at the top of the methods. Makes it easy to create a documentation about a classes' features. Shows the actual order of Controls in a Window (and ContainerControl). You can also modify their order by dragging the items up or down. You can modify values of Properties that are shown when a Project Item of kinds such as "Project", "Window" or "Control Instance" are selected. Simply click into the value's cell to edit it (you may have to select the property first). Some properties contain binary data which can't be edited. Double clicking will show a hex viewer for the data, though. Behaviors are just a folder listing implemented Events and control instances. Instances contain the properties of a control, e.g. its Top, Left, Visible values. If the control is a control array, there will be several instances listed, with their respective index numbers. If it's not a control array, then there will be just one instance, named "-", listed. Since version 1.8.7, Arbed does not automatically associate itself any more with project file extensions (.rbp, .xojo_project etc.) on Windows. To achieve that, you need to invoke the command Associate File Extensions in Registry from the File menu yourself each time you've newly installed or moved Arbed to a different path.